readers, i’d like you to meet my new favorite summer cocktail. summer cocktail, meet my readers. now that introductions are out of the way, let’s talk about this drink! it is simply amazing + couldn’t be more summery, between the ripe, sweet watermelon + the locally grown (our own yard, in fact) basil. 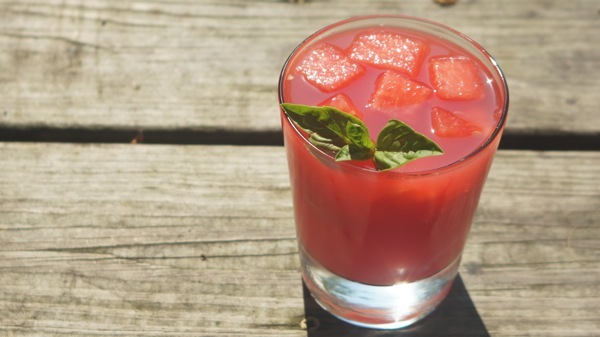 you might wonder, do watermelon, basil, tequila, + triple sec really work well together? well, the answer is YES. in addition to being a glass of summery deliciousness, this recipe also gets bonus points for being gorgeous, quick + easy to make. you can easily double or triple the recipe for a big party – i could definitely see this being the signature cocktail at our next group cookout! in short, i highly recommend that you drop what you’re doing, + go get the ingredients to make this amazing watermelon-basil margarita. we all know that tuesdays are made infinitely better with the addition of a delicious cocktail! place 24 watermelon cubes on a baking sheet lined with parchment. cover, + freeze at least 1 hour (up to 2 days). place tequila + basil in a glass pitcher, + crush with a wooden spoon. stir in watermelon juice + triple sec. place watermelon cubes in glasses. using a cocktail shaker, mix 3/4 cup margarita with 1 cup ice. strain into a glass. repeat. serve garnished with basil. i couldn’t agree more – these are like summer in a glass! the non-alcoholic version with the pickled watermelon rind + proscuitto straws sounds insanely good, too. i like! My kingdom for one of these right this very moment. Ok, that would be inappropriate as its 11am and I’m at work. But I will be giving this a shot soon – I have everything but the basil. Can’t wait to buy some watermelon and make this! Our basil has yet to come out, but sure it will soon! our basil has really started growing like crazy over the past week or two, so yours can’t be far behind. cheers! you basically combined a few of my all-time favorite things in this drink. sending this link to my hubby so he can make me these ASAP! Holy moly. THANK YOU! Watermelon is my fav summer treat, and we have fresh basil growing out of our ears in our garden. I will be trying this this weekend…or maybe tonight! fabulous! can’t wait to hear what you think of it. i’m always looking for ways to use up our basil from the garden, too, which is how i stumbled across this wonderful recipe! Ok, I am making these this weekend! yummmm! Previous post: spike your juice™ GIVEAWAY! Next post: fearless homemaker facebook page!